Bank capital regulation in developed (and may developing) countries is based on the framework set by the Basel Committee in Bank Supervision in its document published in 2010 and revised in 2011 “Basel III: A global regulatory framework for more resilient banks and banking systems”. Basel III requires that banks hold at all times 4.5% of Common Equity Tier 1 (CET1) of risk-weighted assets (RWAs) and an extra 1.5% of Additional Tier 1 (AT1). From 2019 onwards, minimum Tier 1 capital must be 6% and minimum Total capital of 8% of risk-weighted assets. In addition, banks are required to hold a capital conservation buffer of 2.5% of risk-weighted assets. Global systemically important banks (SIBs) have in addition a progressive Common Equity Tier 1 (CET1) capital requirement ranging from 1% to 2.5%, depending on a bank’s systemic importance. For banks facing the highest SIB surcharge, an additional loss absorbency of 1% could be applied as a disincentive to increase materially their global systemic importance in the future (see “Basel III: A global regulatory framework for more resilient banks and banking systems”). National regulators are further allowed to require a discretionary counter-cyclical buffer, up to 2.5% of RWAs and to be held in the form of CET1 capital, during periods of high credit growth. 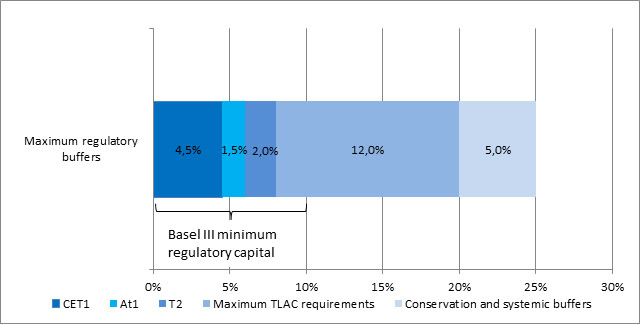 Finally, Basel III introduced a minimum leverage ratio of 3%, defined as the ratio of Tier 1 capital over bank’s average total consolidated balance sheet and non-balance sheet on a non-risk-weighted basis. In the European Union, Basel III has been implemented mainly through the Capital requirements directive (CRD IV) and the Capital requirements regulation (CRR IV). In the United States, Basel III has been implemented mainly by a Decision of the Federal Reserve Board. Both legislations were approved in 2013 and allowed a few years for full phasing-in. Major differences between the US and EU rules implementing Basel III include the treatment of capital instruments, risk weight calculation, the leverage ratio and references to external credit ratings. Bradley K. Sabel (2013) discusses the major differences. The new European rules require the adoption of a large number of delegated and implementing acts, for example on Regulatory Technical Standards and on Implementing Technical Standards. The European Commission provides continuous updates on progress. With respect to capital requirements, the Delegated act on the leverage ratio – 10.10.2014 ensures that EU credit institutions and investment firms use the same methods to calculate, report and disclose their leverage ratios which express capital as a percentage of total assets (and off balance sheet items). The approach to Total Loss Absorbency Capacity (TLAC) is described in a consultative document produced by the FSB in November 2014. According to the proposal, G-SIBs must hold a minimum amount of regulatory capital (Tier 1 and 2) plus long term unsecured debt that are together at least 16%-20% of its RWA (at least twice the B3 total regulatory capital of 8%). Regulatory capital and unsecured long term debt cannot be less than 6% of its leverage exposure (at least twice the B3 leverage ratio) and, in addition to the Pillar 1 requirement, TLAC may also include a subjective component (Pillar 2) to be assessed on an individual basis. TLAC should consist of liabilities that can be converted into equity or written off during resolution (without disrupting critical functions or giving rise to compensation claims). Financial instruments that are eligible for external TLAC requirements are unsecured liabilities issued by the bank with remaining maturity over one year and, with respect to the excluded liabilities that have been explicitly identified, they must be either structurally subordinated (i.e. issued by an entity that does not have excluded liabilities), or contractually subordinated, or statutorily subordinated (i.e. junior in the statutory creditor hierarchy to the excluded liabilities). Regulatory equity capital could be counted for TLAC requirement, but debt instruments would need to constitute at least 33% of TLAC. Capital buffer requirements (e.g. the capital conservation buffer, G-SIB surcharge buffer and countercyclical buffers), sometimes called “Pillar 2” instruments as for the FSB’s proposal, are not counted for the TLAC requirements. Losses during resolution may exceed TLAC: liabilities that are not eligible as TLAC remain subject to potential exposure to loss in resolution. If a G-SIB enters resolution, TLAC issued by the bank and held by external creditors would be written down/converted into the equity of the bank. Losses are therefore absorbed by shareholders and then by external creditors. Depending on the preferred resolution strategy, resolution entities may be the top-tier parent, holding company, intermediate holding companies, or subsidiary operating companies. The resolution group is formed by the resolution entity, and any direct and indirect subsidiaries of the resolution entity. A G-SIB may consist of one or more resolution group (from a single resolution group with the parent company, or it may consists of two or more resolution groups) in which case minimum TLAC requirement should apply to each resolution entity. Total bank capital requirements after the introduction of TLAC are summarized in the table below.